95-6539 DOUBLE DIN DASH KIT. Compatible with Select 2001-2007 Chrysler Voyager, Town and Country / Dodge Caravan, Grand Caravan Vehicles. ISO Double DIN radio provision. for Select Chrysler Town and Country/Dodge Caravan. Cruze 2011-2015. ISO DIN radio provision with pocket. Note: The GMOS-044 will be necessary to retain the center dash display info. DDIN radio provision. Kit Features. DDIN radio provision. Dodge Magnum 2005-2007. Antenna Adapter (99-6519B). (99-6519S). • Warranty service will be refused if serial number of unit does not match that of serial number sold by us. • We strongly encourage professional installation of any electronic devices. DIN Radio Provision with Pocket. Double DIN Radio Provision. Mazda Tribute 08-UP. ISO Mount Radio Provision with Pocket. Stacked ISO Mount Units Provision. Ford Escape 08-UP. XSVI-5520-NAV Ford Digital Interface Harness. Chevy Camaro 1997-2002. • We strongly encourage professional installation of any electronic devices. 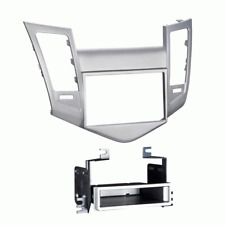 Single/Double DIN Dash Installation Kit for 2011-Up Chevy Cruze with Monochromatic Display. For 2011-Up Chevy Cruze with Monochromatic Display. Single/Double DIN Installation Dash Kit. Accommodates ISO single/double DIN mount. IDatalink Maestro K200. Radio Installation Dash Kit for 2015-2018 Chrysler 200. Dash kit for 2015-2018 Chrysler 200. Radio Installation Kits. Amplifier Install Kit. Installation Accessories. Compatible with all trims, features factory fit & finish and adds a blank button panel for use in trims without the factory button bar Includes. Pictured item are pictures of actual item. No flaws upon inspection. Single DIN Dash Kit for Select 2013-Up Dodge Ram 1500/2500/3500 Trucks. Dash Kit Product Details Designed and manufactured with precision tolerances, resulting in a gapless fit between the dash and the kit. IDATALINK K150 DOUBLE DIN INSTALLATION KIT. iDatalink K150 Dash Kit. Your 2013-14 Ford F-150 with its 4.3" "My Ford" screen is a great truck, but the console makes it tough to upgrade the factory radio. Chrysler Concorde (1998-2004). These speaker mounting brackets allow for the installation of 6.5" or 5 1/4" speakers into the existing front door speaker location. Chrysler 300M (1999-2004). Chrysler Cirrus (1995-2000). The product allows for the installation of a double-DIN stereo, while providing a factory look. The components included are made of high quality ABS plastic to provide maximum durability for lasting performance. Double DIN Installation Dash Kit. Double DIN Radio Housing. Double DIN Radio Housing Brackets. Install dash kit for Double DIN/ISO Radios. Designed and manufactured with precision tolerances, resulting in a gapless fit between the dash and the kit. The wire harness allows you to connect to the factory harness without cutting any wires. The ICCR6BN kit includes step by step instructions and colored coded wires for an easier installation. Easy to install. Give us a chance fix the problem. DO NOT REMOVE SECURITY LABEL, it will void the warranty. We keep records of Serial Numbers for all units we sold. CHEVY CAMARO 2010-UP Double/Single DIN Kit. Installation dash kit for Single or Double DIN Radios. Includes a storage pocket below the radio for single DIN mounting. Accommodates ISO Single DIN mount. For Ford & Lincoln, these are vehicles with SYNC from 2008 or newer. For Chrylser, Dodge & Jeep, these are vehicles with the UConnect system and for GM, these are vehicles with OnStar. It replaces previous versions of the product. Jeep Cherokee Sport w/ 5.0 Touchscreen 2014-up. Ram 1500/2500/3500 w/o 8.4 Touchscreen 2013-up. XSVI-6523-NAV Chrysler Accessory Retention Harness. ISO Mount Radio Provision. • Warranty service will be refused if serial number of unit does not match that of serial number sold by us. Fits most models of Dodge Chrysler and Plymouth through 2004 as well as select Ford and Jeep vehicles. Crown Victoria 1979-90. Van 1978-03. Van 1978-97. • Warranty service will be refused if serial number of unit does not match that of serial number sold by us. A.P. WIRING INTERFACE. STACKED ISO DIN: "COMPATIBLE " WHEN INSTALLING (2) STACKED ISO-DIN RADIOS TOGETHER. If you have one of these larger radios, you will need to "SAND" or "FILE" the opening of theTRIM RING orBEZEL to make it large enough to clear the"FACE" of your radio. 2010 & Up Ford Mustang Double Din Installation Kit. For Installation Of Both Double-Din & Din Radios. Designed for the installation of a ISO DDIN radio. All necessary hardware for easy installation. Designed for the installation of aISO DDIN radio. We are committed to providing you a quality product at the lowest prices possible. Double DIN radio provision Painted a scratch resistant matte black to match factory dash Specifically for non NAV models that have the driver info switches in the factory panel . ISO DIN radio provision with pocket. Chevy Camaro 1997-2002. DoubleDIN radio provision. Wiring Harness. NEW IN OPEN MANUFACTURES BOX. COMPLETE SET ----->AS PICTURED. MISSING PAMPHLET ONLY! (Sx2) BOX SHOWS SIGNS OF WEAR. DDIN Head unit provisions. Chevrolet Cruze 11-UP with Monochromatic Display. ISO DIN Head unit provision with pocket. Note: The GMOS-044 will be necessary to retain the center dash display info. Kit Features. Designed specifically for the installation of double DIN radios or two single DIN radios High grade ABS plastic contoured textured and painted to compliment factory dash Comprehensive instruction manual All necessary hardware included for easy installation . High-grade ABS plastic contoured and textured to compliment factory dash All necessary hardware to install an aftermarket radio Comprehensive instruction manual Painted to match OEM color and finish . Empty Sub Boxes. - Fuse Holders. - Factory Radio. - Signal Processors. - Dash Kits. - Installation Harness. - OEM Harness. Empty Sub Boxes - Dodge. Toyota Tundra 2014-up. Painted high gloss black. We are committed to providing you a quality product at the lowest prices possible. • We strongly encourage professional installation of any electronic devices. Single DIN Radio Dash Kit With Wire Harness & Antenna Adapter. For 2007 & 2008 Dodge Caliber Vehicles. Allows installation of any single DIN, or ISO-mount radio. Includes molded full size pocket with rear support mounting stud.